PEX Plumbing Packages offer a great means of getting started on your first PEX Plumbing Project. PEX Plumbing Packages are available in four different PEX installation methods: the Uponor ProPEX Expander System, HydroPEX Clamp System, PEX Crimp System, and the Viega PEX Press System. 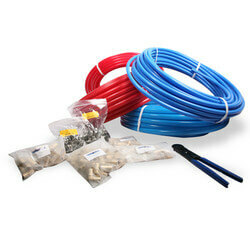 Each PEX Plumbing Package contains the required material for working with 1/2" and 3/4" PEX. 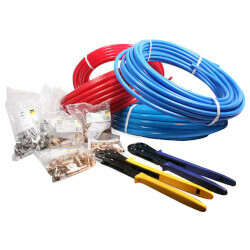 Each package includes a specific tool dedicated to a single PEX installation system. An assortment of rings, couplings, and elbows, are also provided within each package and is compatible with the tool provided. Lastly, (1) 1/2" x 100 Red, (1) 1/2" x 100 Blue, (1) 3/4" x 100 Red, and (1) 3/4" x 100 Blue Coil are provided in each PEX Plumbing Package. The Uponor (Wirsbo) ProPEX Plumbing Starter Kit contains a Milwaukee ProPEX Expansion Tool, ProPEX Rings, ProPEX EP Couplings, ProPEX EP Elbows, Blue and Red AquaPEX tubing (non-oxygen barrier), and a Tube Cutter. The Milwaukee ProPEX Expander Tool found in this package uses a ProPEX Ring to secure a successful connection around a ProPEX Expander Fitting. The Milwaukee ProPEX Expansion Tool provided in this kit is only compatible with PEX-a tubing (Engel Method), such as the AquaPEX tubing provided in this package. The Uponor (Wirsbo) ProPEX Expander system is perhaps the most widely used PEX system by professionals in the United States. The HydroPEX Clamp Starter Kit contains a PEX Ratchet Clamp Tool, Steel Clamps, PEX Brass Elbows, PEX Brass Couplings, Blue and Red Rifeng Tubing (non-oxygen barrier), and a Tube Cutter. The PEX Ratchet Clamp Tool found in this package uses a Stainless Steel Clamp ring to secure a successful connection around a Crimp/Clamp Fitting. The simplicity and cost effectiveness of this system make it the most preferred system by DIYs. 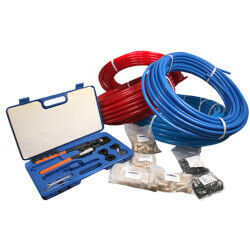 The PEX Crimp Starter Kit contains a PEX Crimp Tool, PEX Crimp Rings, PEX Brass Elbows, PEX Brass Couplings, Blue and Red Rifeng Tubing (non-oxygen barrier), and a Tube Cutter. The PEX Crimp Starter Kit is similar to the HydroPEX Clamp Starter Kit in that they both contain the same PEX Tubing and PEX Fittings. The PEX Crimp Tool found in this package utilizes a Copper Crimp Ring to secure a successful connection around a Crimp/Clamp Fitting. 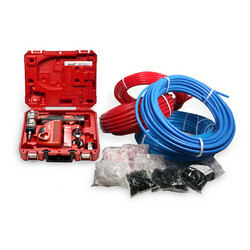 The durability and ease of installation of the PEX Crimp system make this particular kit a favorite amongst DIYs. The Viega PEX Press Starter Kit contains a starter PEX Press Tool Set, PEX Press Sleeves, Viega PEX Press Couplings, Viega PEX Press Elbows, Blue and Red Viega PEX Tubing (non-oxygen barrier), and a Tube Cutter. The Viega PEX Press Tool found in this package utilizes a Viega PEX Press Sleeve to secure a successful connection around a Viega PEX Press Fitting. Viega PEX Press Fittings are commonly used with Viega FostaPEX Tubing but are compatible with any standard ASTM size PEX pipe. Due to the rising health concerns of lead poisoning, Viega has recently unveiled lead-free Bronze PEX Press Fittings. Zero Lead Bronze Fittings have superior dezincification properties when compared to standard bronze press fittings, while maintaining the same trusted listings required for potable water use.